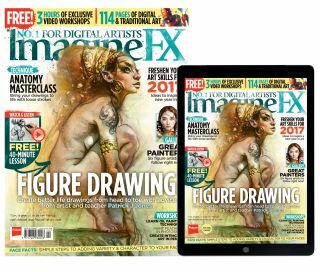 Today’s top-flight artists take every opportunity to practise their anatomy techniques, so this issue of ImagineFX will serve as an excellent reminder that you can never know too much about the art of the body. From Patrick J Jones’ cover art figure-drawing workshop – created in charcoal and Painter – in which he treats you to an unmissable life-drawing lesson, to anatomy guidance with industry veteran Glenn Vilppu, and advice on adding character to faces with Julián del Rey, there’s plenty of key knowledge on depicting the human form. We also showcase leading artists who, in their own way, manage to capture the essence of a figure, get advice on painting bird feathers with Leesha Hannigan, discover what you can learn from the Old Masters with Howard Lyon’s guidance, and reveal pencil art skills with Miles Johnston. But wait! – there's more! We take a peek inside the studio of legendary sci-fi artist John Harris, find out what pro artists are doing in 2017 to push their art even further, and read our review of Wacom’s Intuos 3D package. Where else are you going to get this kind of advice and insight? Yigit Koroglu leads this month’s reader art selection. Send us your paintings – details in the issue! John Stanko and Sara Forlenza are just two to the artists passing on their expert knowledge. The striking drawings of comic artist Abhishek Singh feature in this month’s Sketchbook section. A demon lounges in the faded glories of his once-decadent lair, in Matt Cowdery’s illustration. Faces are the focal point of any character piece - Julián del Rey reveals how to bring them to life.